Tithing helps to support churches. 1. How Much of My Tithe Can I Deduct on My Income Tax? 3. Who Gets Tax Credit on Donation Made on Someone's Behalf? Tithing is a common practice among churchgoers and involves giving a portion of the person’s income to the church. This is an important means of support for many churches, and these organizations count on and encourage the practice of tithing. A tithe can count as a charitable donation provided the giver follows IRS rules for both giving and filing. Failure to follow the correct procedures can result in a person not being allowed to claim tithing on his taxes. 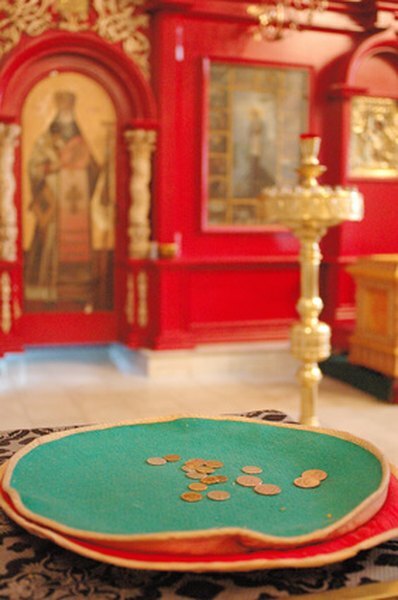 A tithe is a type of donation made to a church, usually on a regular and recurring basis. While there is no hard and fast rule about how large a tithe should be, 10 percent of a person’s gross income is common. Tithing is done weekly, monthly or annually, depending on a person’s situation and the preferences of the church. People may also tithe to other religious organizations, such as synagogues, mosques and temples. According to the IRS publication on how to claim charitable contributions, an organization must be qualified with the IRS before donors can claim contributions. Churches and other religious organizations are recognized by the IRS, meaning that charitable contributions made to qualified religious organizations can be claimed. Some small churches or those that are not mainstream may not be qualified as religious organizations with the IRS, and tithing to these organizations is not deductible. The IRS defines a charitable donation as money given to a qualified organization for the organization’s use. The money cannot be identified for the use of a specific person, such as a church member who has suffered the loss of a home in the fire. The giver also cannot benefit from the contribution. If she does, such as by purchasing a ticket to a fund-raising event where the purchaser gets dinner, the fair market value of the item is deducted from the amount paid. The supporter can only claim the difference between market value and purchase price. Tithing normally fits the IRS definition of a charitable contribution. While most people consider a 10 percent tithe to be appropriate, some people may be in a position to donate a larger amount. The IRS limits deductions on giving to 50 percent of the donor’s adjusted gross income for the year. This amount includes all donations to all organizations for the year as a combined figure. While a person may tithe a larger amount, this is the maximum allowable deduction. Special rules also apply to donations made as a result of capital gains or other special types of income, so it pays to check carefully before making a contribution. Records are essential for proving the amounts tithed during the year. While the IRS may not question very small amounts, anyone who tithes to a church should keep copies of bank statements, cancelled checks or receipts from the church. A single donation of $250 or more must be acknowledged by the church in a written statement. Larger amounts typically have additional rules. To claim tithes as charitable contributions, taxpayers must file the standard Form 1040 and Schedule A, and enter the amounts on the appropriate lines. Large amounts may require additional documentation, typically Form 8283. Do I Have to File My Earnings if a Church Pays Me? Can I Deduct Wages Paid With a 1099 on My Income Taxes?